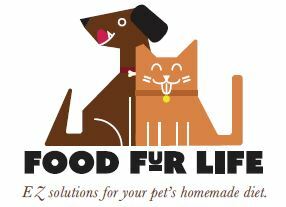 Food Fur Life - EZ Homemade raw food for pets! Welcome to Food Fur Life, where feeding homemade pet food is EZ! At Food Fur Life, we believe in simple. Our premixes are designed to make it as easy as possible to feed your pet a homemade complete and balanced diet based on the prey model. With no fillers, no additives, no thickeners, no flow agents and no preservatives, EZComplete Premixes are designed to nourish your pet the way nature intended. Buy boneless meat, add water and EZComplete. That's it, you're done! ...Unless you want to cook the meat first. EZComplete premixes can be used with raw OR cooked meat, both will be balanced and complete for All Life Stages. Please enjoy browsing the information on our site. We have a wealth of information to help with your cat or dog's transition. And don't forget, we are available and here to help! Stay up to date on Food Fur Life news and promotions!